Is it Brown? Is it Red? is It Orange? What can bring it back from the depths of rusty pipe condition? I tired the Aqua and blue to compliment corrosion... and added a bit of green too... thinking about copper roofs and the great colors it morphs into. 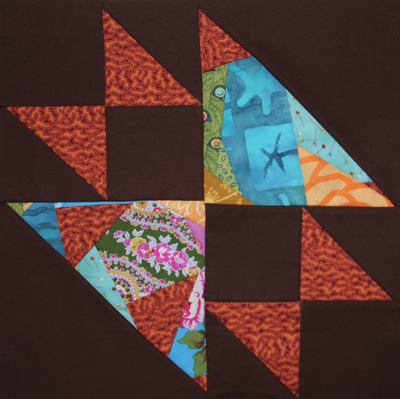 Each week I have also been showing you a different lay out of my blocks. Taking 15 minutes to LOOK at the layouts, and trying ALL of the options before deciding what my next move will be. I want to wait in crossing that bridge, until I have all my blocks made. I don't want to miss out an idea. Every time I make a quilt, I try to incorporate something NEW to make them unique and different from the last quilt. I don't always want to make blocks and sash them. What new element can you bring to each quilt you make? Listen to your quilt as you build. Look at it. Ponder it, and push your limits on your skills with setting your blocks. I haven't a clue how this quilt will end up living... I am enjoying the discoveries I make, each time I play with the blocks. Keep open to new possibilities. Ok this is getting tough. Dusty blue was pretty slim in my stash, and RUST is totally missing in action. Maybe a few errant hand dyes, but not much. Have to dump the scrap box and do some serious scrap digging. You are really taking us back to the Good(?) old days with these colors! First dusty blue, and now the OTHER staple of every quilter's stash, circa 1980. In the midwest, we used them both together! 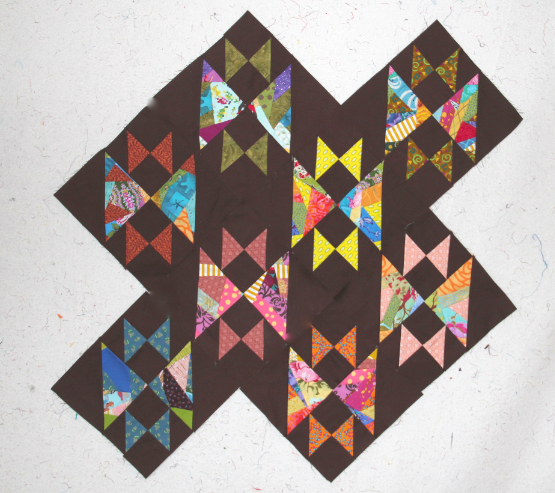 I can't tell you how many quilts I must have done with dusty blue, rust and brown. Yow. Rust is a little easier because it's almost orange! Love that squiggly rust fabric and I especially like it with the bright blue and turquoise.